Bill Boushka: The Nationals and Redskins and "injury management": OK, there are moral lessons in "shared responsibility"
The Nationals and Redskins and "injury management": OK, there are moral lessons in "shared responsibility"
Rooting for big league sports teams may be an expression of eusociality, and it may be an example of shared consciousness or shared identity, actually important in theoretical physics (Books blog, June 1). So today, it’s time again to try to help the struggling Washington Nationals with a post. One thing about dreams is that you can do what you want in them without consequences. You can change the rules. Last night, I dreamed I was at a Nat’s game, and in the top of the Ninth, with the Nats protecting a one-run lead, the visitor hit a line drive into the right field corner, and after misplaying, made an inside-the-park homerun. But the batter missed second base. So I ran out onto the field, got the ball, and touched the bag. The Nats won, with the help of a tenth player on the field (me). Call it “Inception”. The Nationals are struggling for two main reasons: inconsistent management of injuries, and the lack of performance from a lot of other players besides the sidelined Bryce Harper. It’s odd that the clean-living LDS boy has been seen as the “savior”. Harper had talked about working with a volunteer fire department, as public service (I wouldn’t to that), but I bet that’s out. The Nats managed Stephen Strasburg by the book, but not his dopplegangers. For the rest of the players it seems as though they follow the script of the Redskins – who I believe would have won that playoff game with Seattle last year had they put in Cousins immediately once RGIII was struggling with the knee near the end of the first half. In baseball, those oblique strains have a way of lengthening into 50-game sit-outs. In baseball, to win you need a solid hitter in every lineup position. It helps to have good hitting pitchers in the National League (the Nats do). But after a couple of major injuries this year, it looked like the team picked for the World Series had a minor league presence. As they say in the Army, “that’s the breaks”. You don’t get to reschedule because of injuries (although home teams can play games with rainouts). Losses due to bad luck count as much as those earned by skill. The old Senators were like this in the 1950s. They had their “fearsome foursome” of home run hitters, but have a couple of injuries, they were fodder for 18-game losing streaks like that horrible western trip in 1959. When the “new Senators” came on the scene in 1961, they seemed like a minor league team. 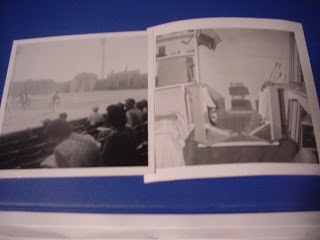 Old Griffith Stadium’s walls were pushed back to give them a better chance. No matter, they were 30-30 as of the night of my high school graduation. But then they went to Boston, got swept (blowing a 7 run lead with two outs in the bottom of the ninth), and never recovered. Over time, expansion teams in the majors got up to speed more quickly. Look at the success of the Kansas City Royals in the 1980's. The curious thing that, despite my own incompetence in sports, I always did identify with local baseball and football teams (not basketball, soccer, or hockey, though) . There was something instructive about it. Your own sense of well-being was totally at the mercy of whether somebody else performed. I cannot do anything about whether Roger Bernadina can fill in at the bat for Bryce Harper, personally. Yet I feel affected. Actually, today, that’s not quite as true as it was. I can tweet and blog, and I’ve actually gotten response from a player at least once. So what I write maybe really does matter to the team. Maybe I can be effective. I do have one concrete suggestion as to managing the injuries (for all the sports teams). Have one medical facility in the DC area with specialists who see and evaluate all injuries first. It doesn’t make sense to have to travel 1000 miles to decide if someone needs to be on the disabled list. (I have nothing against Pensacola, FL -- was there in 1998 to see the Brownsville AOG, but, well, it's a long trip to the sticks.) Have the expertise lined up right here. Hospitals love sports business, because sports teams can pay; it’s profitable. The nearby Virginia Hospital Center in Arlington would do just fine. The lesson on “group consciousness” and shared outcomes does speak to our concerns with “personal responsibility” as libertarians understand the concept. In real life, when you’re on your own (as I am now), you’re really exposed to how well others do their jobs. You’re interdependent with others whether you want to be or not. I’’ve explored this plenty of times before (March 13, 2011 seems to be a typical post that got around.) I’ve talked about this gently in the workplace blogs when I discuss customer service and how critical it is today. But it also has big time security implications. In real life, you’re also exposed to the hardships of others and particularly their indignation, even if you didn’t personally cause it or think you are very distant from it (in the sense that the NSA defines “degrees of separation”, which can be less than you think). I found this out in a personal way at various points in my life: in Army Basic (1968), and after dabbling around with a little left-wing activism after I was on my own (1972). On the LGBT blog, I talked about being asked (almost ordered by confrontation) to give someone a ride Sunday as I was leaving the festival in Baltimore. This time it was pretty “safe”, but sometimes we really do have to put ourselves in danger for others. (What was the military draft all about when I went in 1968?) Another person can make his or her anger or need your reality for the rest of your life. He can force “you” to face dependency and need the attention and feeling from others than “you” may not have been able to extend yourself, if your own demand for perfection in those close to you. Call that the “upward affiliation” problem. The perpetrator may be brought to justice, but your own personal reality changes forever, at the will of another person. It does not good to talk about being a “victim”; you are a casualty. You were conscripted. All of this went through my mind as I reviewed a detail transcript of my own time in Army Basic recently, which I’ll explain the significance of more soon. It’s striking how “personal” the attack at the Boston Marathon was; I can think of many other scenarios that could have been more publicly catastrophic (I’ve mentioned them here before)., but this attack depended so much in person from others. So, maybe it’s a good thing that I did “step up” on Sunday when confronted unexpectedly by need, and maybe a little risk. It's troubling that doing so for someone doesn't "mean enough" to me. It's a problem if it has to, or if I have to mean too much to someone else if something has happened to me. Let’s hope that Gio Gonzalez (cleared by MLB) gets the job done tonight, on the last game of this road trip in Philadelphia. I have a hunch he will. The Nationals return home Friday against the Rockies, and are owed a lot of home games.